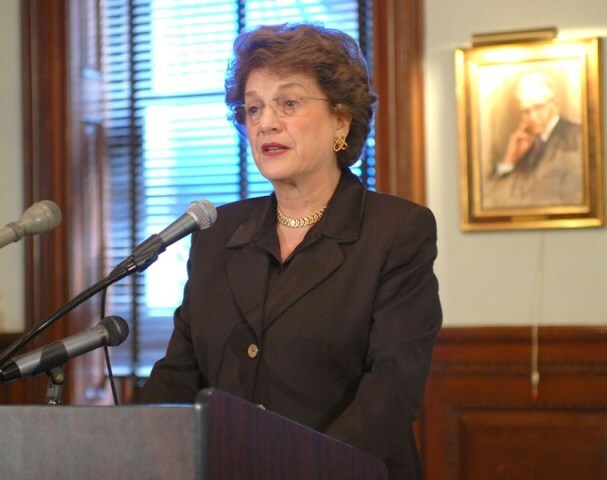 Judge Judith S. Kaye was a familiar, regular and welcome presence in our 44th Street building before, during and after her service as Chief Judge - having effectively started her legal career within the halls of the City Bar as Assistant to then President Russell Niles. She volunteered to serve on numerous committees, including our Executive Committee, before she became a judge, always supporting the City Bar’s mission to improve justice, reform the law and advance ethics in the profession. In September 2001, when she was Chief Judge, she was here on 44th Street, walking the line and offering support as lawyers waited to volunteer to serve 9/11 victims and survivors. The City Bar awarded her Honorary Membership in 1995 and the Association Medal in 2008, both meant to recognize those who have made exceptional contributions to the honor and standing of the bar and the advancement of justice in the community. We are grateful for her accomplishments that will continue to bear fruit, in particular her leadership in reforming our court system and her creativity in finding new approaches so that New York’s justice system could be more accessible to the countless New Yorkers who rely on it. In September 2017, the City Bar officially dedicated the “Kaye Room” in Judge Kaye’s memory. This dedication marks the first of the City Bar’s rooms to be named after a woman, fitting because she was the first woman to serve as Chief Judge and the longest-serving chief judge in New York history.